Joey is a warhorse, but he wasn’t always. Once, he was a farm horse and a gentle boy named Albert was his master. Then World War I came storming through and everything changed. Albert’s father sells Joey to the army where the beautiful, red-bay horse is trained to charge the enemy, drag heavy artillery, and carry wounded soldiers not much older than Albert off of battlefields. Amongst the clamoring of guns and slogging through the cold mud, Joey wonders if the war will ever end. And if it does, will he ever find Albert again? So I have to admit when I first started reading this book, I didn’t have high expectations. 1) It’s so short! I know less is sometimes more but… it’s 165 pages. That could get lost in my back teeth! 2) It’s aimed at younger readers. And I mean…. younger readers. I’d say middle grade at least. And then I found out it was told from the perspective of a horse and…. 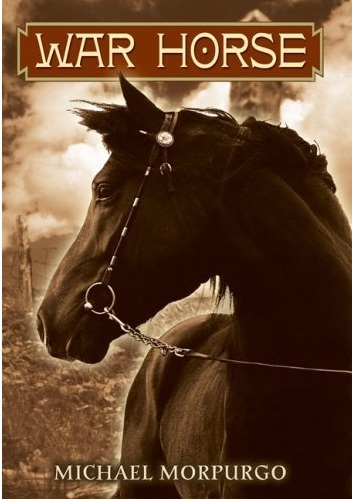 OK, I really didn’t know much about this book before I started it so I was kind of aghast when I saw how short it was, how it was probably written for people half my age and that it was told from the perspective of probably the great great great granddad of the horse WHO NEARLY ATE ME. And that, my friends, is why you should always do your research. But research can sometimes be a problematic thing because if I had read about this book and found out the aforementioned stuff and I know I would have given this book a miss. And I would really have missed out on a wonderful book. Joey’s story starts in the tranquil fields of a Devon after being bought as a young colt from an auction house when Britain was on the cusp of the First World War. He is soon sold into the cavalry and shipped off to France. Even though this book is aimed at a middle-grade level, this book didn’t read like it. The language was evocative, descriptive and captivating. Mr Morpurgo never talks down to his readers and choosing honesty rather than sheltering them from what really happened in WW1 because it could be too distressing. What I enjoyed most about this book is how Joey was used as a vehicle to explore the feelings of the soldiers, on both sides of no man’s land. As the book, and the war, goes on and his circumstances change, Joey’s journey leads him to meeting a handful of characters in the war torn fields of France. Whether it was Captain Nicholls, Friederich, David, Emilie or Topthorn, his fellow horse, the connections he made with them were always true, even if they were fleeting. I loved how the soldiers (and let’s not forget Emilie!) saw Joey as their fellow comrade, feeling comfortable to sit with him in his stables and tell Joey their secrets, their worries and their futures. For me, it was these interactions with “the real heroes” that made this story so powerful and intricate, even though the pages were minimal. It is a poignant story that combines the themes of determination, unwavering devotion, bravery and compassion with a story that a lot of people will find interesting. Before reading this, I knew little of the cavalry in WW1 or actually how many horses served over there. The scenes with the Veterinary Corps were particularly interesting because you don’t really think of things like that when you think of the First World War. OK, maybe you do. But I certainly didn’t. I can understand why this book, which was first published in 1982 , is so widely read in schools and of course why it is now an award winning stage play (which I desperately want to see by the way. I saw a documentary about the making of it and it looks brilliant). A lot of the feelings and emotions that Morpurgo explores are not only universal, but timeless too. I could, with mild reluctance, say that Joey would be the only horse I would be willingly friends with. And I’d even let him have a bit of the crusty bread. As long as he promised to leave my garments alone. Also: When I was passing through WHSmiths today, I saw that all Michael Morpurgo books are half price- including this one! I’m not sure how long it’s one for though! This review is part of my Poppies & Prose feature. Find out more here. Did you see that they are making this a movie? This sounds like something I would have loved when I was younger. I ADORED animal books, and especially animal books told from the perspective of said animals. I'll have to keep an eye out for this one! « Poppies & Prose: An Introduction.